"Poetic musings on a life well-lived—one that is still moving forward, always creating, always luminous. This isn't your typical autobiography. Garfunkel's history is told in flowing prose, bounding from present to past, far from a linear rags-to-riches story." —Bookreporter "It's hard to imagine any single word that would accurately describe this book . . . an entertaining volume that's more fun to read than a conventional memoir might have been." —The Wall Street Journal "A charming book of prose and poetry printed in a digitalized version of his handwriting . . . witty, candid, and wildly imaginative . . . A highly intelligent man trying to make sense of his extraordinary life." —Associated Press From the golden-haired, curly-headed half of Simon & Garfunkel, a memoir (of sorts)—moving, lyrical impressions, interspersed throughout a narrative, punctuated by poetry, musings, lists of resonant books loved and admired, revealing a life and the making of a musician, that show us, as well, the evolution of a man, a portrait of a life-long friendship and of a collaboration that became the most successful singing duo in the roiling age that embraced, and was defined by, their pathfinding folk-rock music. In What Is It All but Luminous, Art Garfunkel writes about growing up in the 1940s and ‘50s (son of a traveling salesman, listening as his father played Enrico Caruso records), a middle-class Jewish boy, living in a redbrick semi-attached house on Jewel Avenue in Kew Gardens, Queens. He writes of meeting Paul Simon, the kid who made Art laugh (they met at their graduation play, Alice in Wonderland; Paul was the White Rabbit; Art, the Cheshire Cat). Of their being twelve at the birth of rock’n’roll (“it was rhythm and blues. It was black. I was captured and so was Paul”), of a demo of their song, Hey Schoolgirl for seven dollars and the actual record (with Paul’s father on bass) going to #40 on the charts. He writes about their becoming Simon & Garfunkel, ruling the pop charts from the age of sixteen, about not being a natural performer but more a thinker, an underground man. He writes of the hit songs; touring; about being an actor working with directors Mike Nichols (“the greatest of them all”), about choosing music over a PhD in mathematics. And he writes about his long-unfolding split with Paul, and how and why it evolved, and after; learning to perform on his own . . . and about being a husband, a father and much more. "Poetic musings on a life well-lived—one that is still moving forward, always creating, always luminous. This isn't your typical autobiography. Garfunkel's history is told in flowing prose, bounding from present to past, far from a linear rags-to-riches story." "It's hard to imagine any single word that would accurately describe this book . . . an entertaining volume that's more fun to read than a conventional memoir might have been." "A charming book of prose and poetry printed in a digitalized version of his handwriting . . . witty, candid, and wildly imaginative . . . A highly intelligent man trying to make sense of his extraordinary life." From the golden-haired, curly-headed half of Simon & Garfunkel, a memoir (of sorts)—moving, lyrical impressions, interspersed throughout a narrative, punctuated by poetry, musings, lists of resonant books loved and admired, revealing a life and the making of a musician, that show us, as well, the evolution of a man, a portrait of a life-long friendship and of a collaboration that became the most successful singing duo in the roiling age that embraced, and was defined by, their pathfinding folk-rock music. 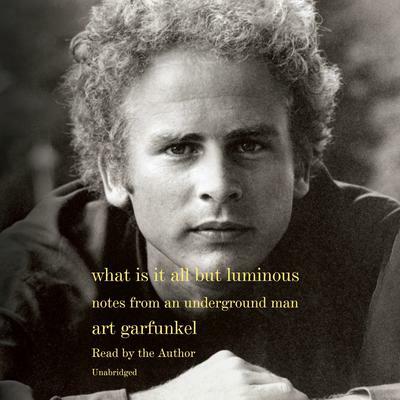 In What Is It All but Luminous, Art Garfunkel writes about growing up in the 1940s and ‘50s (son of a traveling salesman, listening as his father played Enrico Caruso records), a middle-class Jewish boy, living in a redbrick semi-attached house on Jewel Avenue in Kew Gardens, Queens. He writes of meeting Paul Simon, the kid who made Art laugh (they met at their graduation play, Alice in Wonderland; Paul was the White Rabbit; Art, the Cheshire Cat). Of their being twelve at the birth of rock’n’roll (“it was rhythm and blues. It was black. I was captured and so was Paul”), of a demo of their song, Hey Schoolgirl for seven dollars and the actual record (with Paul’s father on bass) going to #40 on the charts. He writes about their becoming Simon & Garfunkel, ruling the pop charts from the age of sixteen, about not being a natural performer but more a thinker, an underground man. He writes of the hit songs; touring; about being an actor working with directors Mike Nichols (“the greatest of them all”), about choosing music over a PhD in mathematics. And he writes about his long-unfolding split with Paul, and how and why it evolved, and after; learning to perform on his own . . . and about being a husband, a father and much more. Art Garfunkel attended Columbia University, where he earned a master’s degree in mathematics. He performed with Paul Simon as Simon & Garfunkel from 1963 to 1970. Along with Paul Simon, he has been the recipient of six Grammy Awards and the Grammy Lifetime Achievement Award and in 1990 was inducted into the Rock & Roll Hall of Fame. He continues to travel around the world giving concert performances, and since 1973 has produced twelve solo albums.